Beginning with a few trees received as a gift, the orchard started as a hobby in 1986. It has since "blossomed" into a full-fledged family farm. 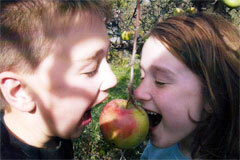 Stotler's Orchard is now home to over 3,000 fruit trees covering over 30 acres of land. Most of our fruit trees are apple trees. After doing a little figuring, we are proud to boast that we grow over 113 varieties of apples! We have both new varieties, like Fuji's and Jonagolds, and older varieties that our grandparents might remember--like Sheepnose and Golden Russet found in our second orchard that we like to call the "Antique or Heirloom" Orchard. With all the many flavors to choose from, you are sure to find one that suits your taste buds! 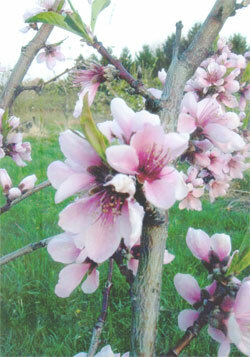 In addition to the many, many bushels of apples we harvest each year, we also grow peaches, plums, and pears. These are not available for u-pick. They may be purchased in our market. For prices go to the Apple Store page.